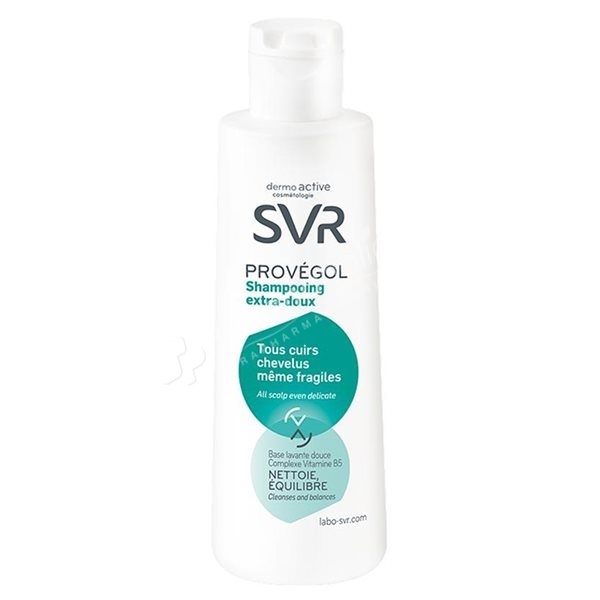 SVR Provégol Extra-Gentle Shampoo cleanses and balances all scalp even delicate while making the hair shiny. Formulated with a gentle cleansing base and vitamin B5 - amino acid complex, this extra-gentle shampoo cleanses while respecting the physiological balance and reconstructs and protects the hair. It can be used for daily use and between applications of treatment shampoos. Tested under dermatological control. Paraben free. Aqua, Disodium Laureth Sulfosuccinate, Cocamide DEA, Sodium Laureth Sulfate, Glycerin, PEG-7 Glyceryl Cocoate, Sodium Cocoamphoacetate, Sodium Cocoyl Apple Amino Acids, Cocamidopropyl Hydroxysultaine, PEG-15 Cocopolyamine, Sodium Cocoyl Amino Acids, Potassium Dimethicone PEG-7 Panthenyl Phosphate, Sarcosine, Laureth-2, Lactic Acid, P-Anisic Acid, Sodium Hydroxide, Hexylene Glycol, Propylene Glycol, Sodium Chloride, Sodium Benzoate, Disodium EDTA, Methylisothiazolinone, Parfum.